Levett Consultancy is proud to announce that during August 2018 the company entered into a partnership with the Essex Cricket Foundation charity. This partnership sees the Essex Cricket Foundation become part of our community programme that enables us to give back to local communities. 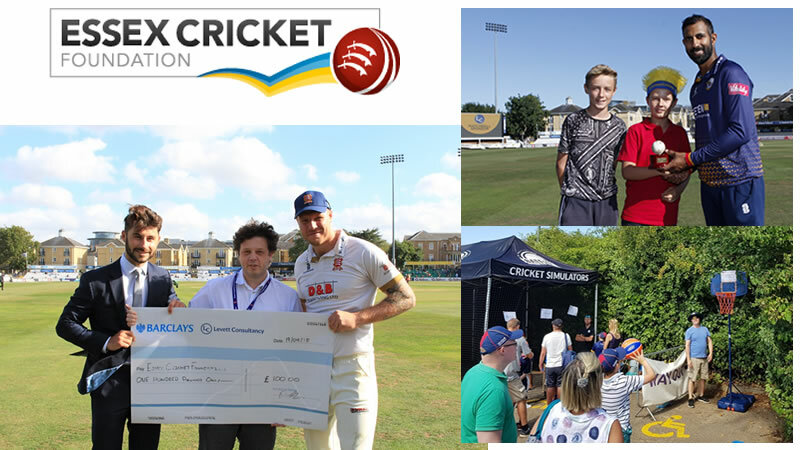 During August Levett Consultancy raised £100 for the Essex Cricket Foundation at the Essex Cricket T20 game against Surrey Cricket Club. Where a lucky family won the opportunity to collect the game match ball and have a photo taken with Essex County Cricket opening batsman Varun Chopra. Levett Consultancy CEO Paul Levett then presented the £100 cheque at a County Championship game to Matt Coles and Greg Larkin. Money raised for The Essex Cricket Foundation is spent on delivering a variety of different programmes to ensure people from all sorts of backgrounds have the opportunity to experience the sport. Funds are spent on providing disability cricket, supporting Women & Girls initiatives as well as street programmes in urban areas across the Anglia and East London. For more information on our community programme head over to our community section here.